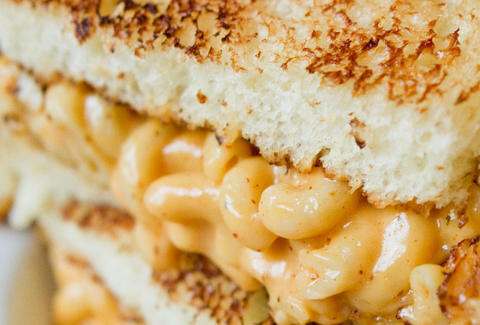 It's an undebatable fact that grilled cheese is delicious, whether it’s the straight-up classic, or the work of some evil genius who swapped those slices out for mac & cheese. Recklessly disregard your health and make sure you try these nine grilled cheese sandwiches that represent the finest carbs-and-cheese work being done around San Diego. This classic sandwich from The Cheese Store of San Diego proves that sometimes the cheese stands alone, and is perfectly content doing so. The panini-style sandwich on French bread stars two-year aged white cheddar, 10-year aged Comté, and nothing else. It may look unassuming, but the flavor profile is tangy, creamy, and slightly nutty. You don’t need to get a bowl of soup topped with crispy potato chips with it, but you probably should have it anyway. If this mozzarella, white cheddar, Fontina, and Cambozola cheese sandwich looks familiar, that’s because it’s so good, we had to mention it twice. 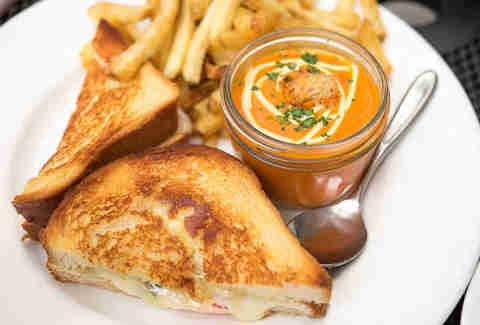 Even without the Kennebec fries and creamy tomato-fennel soup taken into consideration, it’s a worthy addition to any grilled cheese bucket list. Devour one ASAP. If you’re big on blue cheese, make a beeline to this bakery and cafe for this oven-roasted sandwich. Between two thick slices of rosemary olive oil bread, there’s enough triple cream French brie and crumbled gorgonzola to subdue your strongest cheese craving. Don’t forget the fresh Roma tomatoes; they’ll cost you 45 cents extra, but they really help cut through the sharp, earthy flavor of the gorgonzola. Tip: this is one of the few places where you can order a half or whole sandwich. Go for the half and get a cookie (or get a whole sandwich and a cookie... the point is... get a cookie). The cheese whizzes at Venissimo will make you a panini with your choice of any cheese in the case -- or you can choose from the list of pre-designed sandwiches, like the Alpine (nutty Swiss, cornichons, and onion) or the Hot Mamma (smoky chipotle cheddar and soppressata). Our advice? 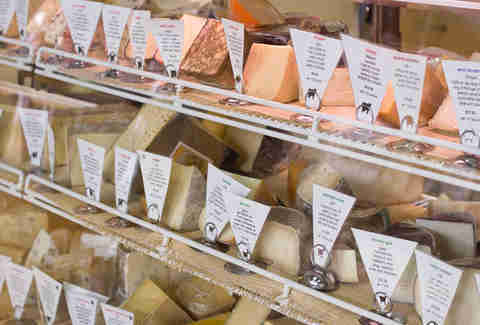 Sample a few different meats and cheeses that call to you in the case and pick your favorites. Bonus: every sandwich comes with a small serving of fruit, so you can have yourself a tiny little picnic. 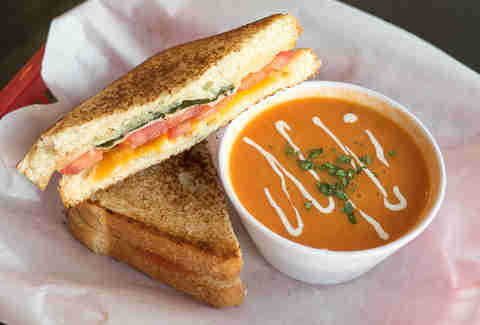 This delicious ‘which starts out super-classic, with plain white bread, and then gets a whole lot more compelling, with muenster cheese, smoked mozzarella, cheddar cheese, light blue cheese crumbles, sliced tomato, and fresh basil. 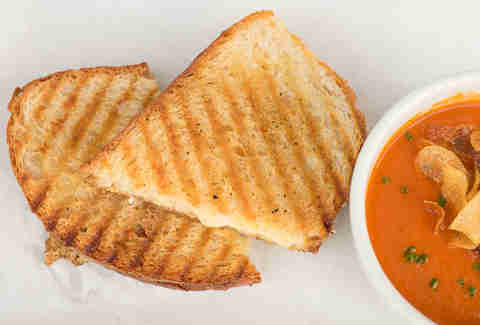 Tomato-fennel soup is a must, no matter which sandwich you order at The District. Luckily, it comes gratis with this one. 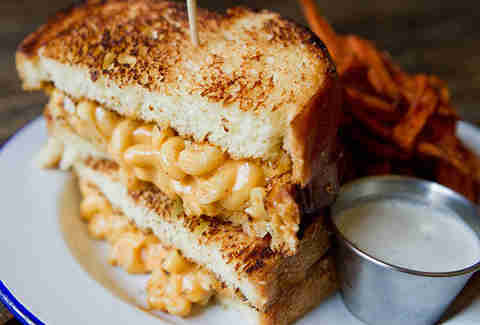 Thick slices of butter-soaked brioche bread barely hold the creamy macaroni noodles bathed in a rich, cheddar cheese sauce (with a subtle kick) in this ingenious creation that feels a little wrong, yet so, so right. You can try to pick it up, but the smarter move is to knife-and-fork-it. 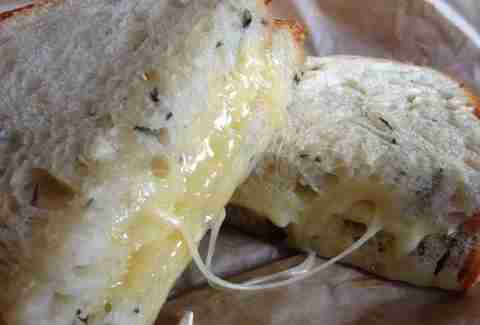 It might feel strange, but it’ll spare your pants from the inevitable cheese splatter. 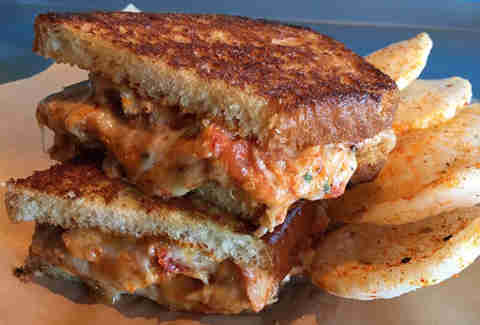 A four-cheese mix (white cheddar, goat cheese, mozzarella, and Pecorino Romano) blankets Italian marinated tomatoes and tender pieces of umami butter-poached Maine lobster spiced up with Korean chili flakes and tri-chili aioli in this melty creation on griddled brioche bread. It’s named after a mythological beast that’s part-lion and part-eagle ("duh" all the Harry Potter fans say in unison). There’s no soup on the side, but you do get some Togarashi shrimp chips, and this isn’t really a dippable sandwich, anyway. Yep, there’s some green stuff on this sandwich, but don’t freak out. 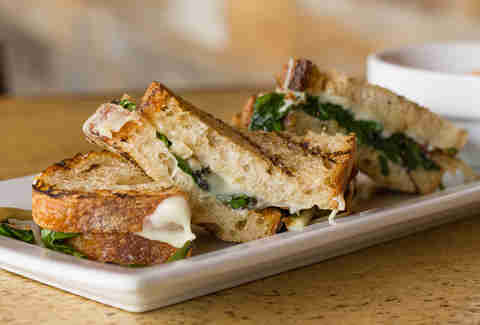 It’s spinach, and it’s actually a great addition to the gooey Holey Cow cheese, earthy beech mushrooms, and savory truffle oil that’s brushed on the bread. A cup of squash soup comes on the side, so dunk away. 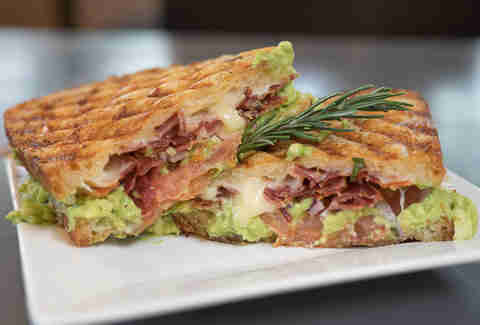 Don’t worry, there’s no lettuce on this grilled cheese panini from Extraordinary Desserts (because hot, limp lettuce is gross), but there is tangy Mahon cheese, organic hickory-smoked bacon, sliced tomato, mashed avocado, chipotle mayo, and a few thin slices of red onion. Want a veggie version? Swap out that delicious cured pork product for smoked tempeh bacon. All this goodness melds together between sliced Bread & Cie sourdough to form one magnificent ‘which. Bonus: on Tuesdays from 5-11pm, you can get it (or one of the seven other variations) for $8 (regular price is $10.95). Bring a friend and split it; you don’t want to miss out on dessert.